If you’re an engineer at a small medical device company, chances are, at some point, you’re going to be asked to manage a project.If your first thought is “That can't be too hard. I already know what the requirements are for designing a medical device.” You’re not alone. Unfortunately, you’re also completely underestimating the task of medical device project management. Being a project manager is a lot more than just understanding the requirements. That’s certainly a part of it, but only a small part. It can be easy to get overwhelmed with creating and maintaining a schedule. 1. Understand the full scope of the project. You’ve got a team and you’ve been given the task of designing a device. Think that’s the full scope? Think again. Identifying the scope of the project is similar to identifying the user needs of a medical device. There is likely going to be someone who gives you the basic idea, but you need to dig a little deeper before you hit the ground running. Spending time upfront confirming the assumptions that have been made and understanding the company’s (or customer’s) expectations for each step of the project will save you a lot of time and energy down the road. Just like user needs, if you don’t understand the scope until the middle or end of the project, you’ll quickly discover that what you’ve done isn’t what the company (or customer) wants. 2. Identify the risks early on. If you spend any time around someone in your quality department, you’ve likely been told that you need to think about risk early and often. The same idea applies to medical device project management. While your quality team wants you to think about risk as it relates to the patient or device, as a project manager, you need to think about risk as it relates to the schedule. What parts of the project are going to be the riskiest? Any time you have new technology or a new vendor, you’re going to have more risk. Take some time upfront to identify the trickiest parts of the design or the critical deadlines. If you’ve done a good job on identifying risks early, the schedule will be more accurate. It seems like everyone wants to get products out the door yesterday. The next best thing is to get the product out the door when you say you will. When you create the initial schedule, it is extremely important to be as realistic as possible. Take the scope you identified and begin to lay out the milestones from creating user needs to shipping the finished product. Make sure you identify how these tasks are linked together and who should be responsible for the task. Then start assigning how much time each task should take, but don’t worry about assigning dates yet. Next, take the risks you’ve identified and add extra time to the tasks that are impacted by the risks. Once you have a list of all of the task, their dependencies, and the risks associated, assigning dates should be a lot easier. You should also add in key business dates, if known. By factoring in risk, understanding scope, and assigning responsibility, your schedule will be a lot more realistic and you’ll be more likely to hit the target end date. If you just arbitrarily assign dates in a schedule, you are setting the team up for failure. 4. Hold other people accountable. In your schedule, you should have specific people assigned to specific tasks. It’s tempting to assign the task to a group of people rather than one specific person. It doesn’t matter how many people are working on a task, pick one person to be accountable for the success or failure of a task. If you assign multiple people, no one will take ownership and a task won’t get done. You also need to know who to go to for status updates and who to hound as the deadline approaches. If you don’t want a date to slip, you’ll need to be in regular contact with them about the status and what tasks are still remaining. Just make sure you don’t have one person responsible for everything. People can only handle so much at once. 5. Communicate early and often. The last thing to keep in mind is communication. Just like risk, you need to communicate early and often. Some schools of thought include having daily meetings to ensure the team is communicating frequently. Whatever approach you take, make sure you know who, what, and how. Not everyone needs to hear all of the details, but you do need to keep the stakeholders in the loop. 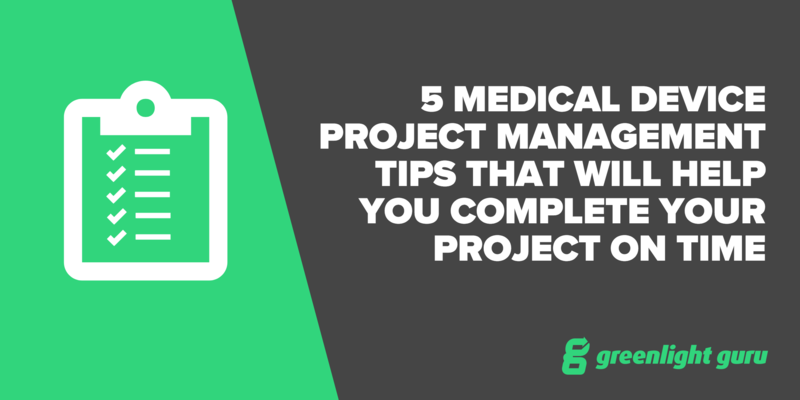 If you keep these 5 tips in mind, creating and maintaining a medical device project schedule will be a lot easier. You won’t have to frequently change the dates, because you’ll have thought about risk and been realistic in the timeline. You’ll also be able to get through status meetings quickly, because you’ll have one person for each task. And most important of all, you’ll be more likely to deliver the device when you said you would!